Place: The National Mall, Washington, D.C.
On August 28, 2010, the 47th anniversary of Martin Luther King Jr's famous "I have a dream" speech, right winged conservative pundit Glenn Beck held the "Restoring Honor Rally" as an event about values, patriotism and restoring honour in America. This was held on the steps of the Lincoln Memorial as was the King rally however Beck was reported as saying he positioned himself not exactly in the same spot as King out of respect for the man. As a basically Christian event, it is a curiosity that Beck is a Mormon. The main speakers also included Sarah Palin and Alveda King, the niece of King. The rally has been considered a gathering point for the conservative movement in the United States. While separate from the Tea Party, Mr. Beck's personal politics demonstrated on his television show, on the radio, in his books, etc., are very much representative of the ring wing, conservative, religious fundamentalist part of the American electorate. Comedy Central is a television network whose mainstay is... well, comedy and two of its more important shows are the Daily Show with Jon Stewart and the Colbert Report. Both shows give a humorous analysis of the news and while each of the shows only garner about two million viewers, their followers seem to be extremely loyal. Compare that with the number of viewers for some other popular shows such as Glee (11.5 million) and Dancing with the Stars (15.5 million). In response to the Beck rally, first Stewart followed by Colbert hatched a plan to hold a similar rally however one which would be for the majority of Americans representing the reasonable elements of the political scene, those who don't have extreme political views and lack a voice in America. Apparently Stewart's first mock motto for the rally was "Take it down a notch America". He offered a protest sign which said, "I disagree with you, but I'm pretty sure you're not Hitler." All of this was considerably amusing in comparison to some of the outrageous statements and signs coming out of the Tea Party end of the political spectrum: Obama compared to Hitler; Obama's health care compared to Nazi death camps, etc. What is surprising is that more mainstream figures seem to be coming on board as the groundswell for this event has been growing. On the October 14 episode of the Daily Show, none other than Oprah Winfrey showed up via satellite in the New York studios and much to the surprise of the studio audience, gave everybody free airline tickets to attend the rally in Washington, D.C. (Does Oprah have her eye on a political future?) Even President Obama has mentioned the rally at a town hall meeting in Richmond, Va. on Sept 29. While the rally started out as a single event in Washington, an obvious poke at Beck and ring wing America, various secondary rallies proposed for the same date have sprung up around the U.S. organised by volunteers not affiliated with Stewart and Colbert. This is testimony to the loyalty of their fan base. At last count, there are almost 70 of these secondary rallies planned and even a dozen international rallies including Montréal, Canada, London, England, Pairs, France and even the base camp at Mount Everest. Estimates for the number of attendees at the Beck rally have varied greatly; a practical one has been several hundred thousand, possibly half a million. Stewart was hoping for something modest of maybe 25 thousand but as of this writing, the Facebook page for the event shows 224,575 people. What is the Daily Show? For those of you who are not familiar with this comedy fare, this "fake news" show, as it likes to call itself, is a comedic take on the news. While I'm sure in the beginning it was strictly for the laughs, the show has become something of a symbol even in mainstream journalism as pointing out the absurdities of what's going on in the world with an emphasis, of course, on American politics. I would say that its slant maybe somewhat for the Democrats, maybe more liberal than conservative but at least for a more reasonable, moderate platform. Nevertheless, it takes great delight in skewering the stupid and the pompous in Washington. Oddly enough, one comedic "bit" of the show is when the host Jon Stewart in reporting on something which is just so absurd that it defies imagination, leans into the camera and says quite seriously, "I'm not making this up, folks." That is probably one of the best aspects of the show. It is a comedy show trying to funny, trying to mock reality when in fact, reality is sometimes just so unbelievably stupid, absurd or weird, Stewart doesn't have to make a joke, just reporting the story is funny enough. 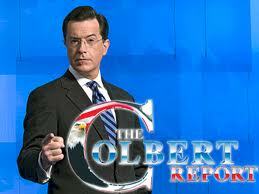 What is the Colbert Report? The comedian Stephen Colbert started on the Daily Show but at some point was spun off to a separate show. His character per se, a foil to Jon Stewart is a ring wing conservative pundit, a caricature of somebody like Bill O'Reilly or Glenn Beck. Unlike Stewart who plays himself as a reporter, Colbert is deliberately playing this outrageous character and his humour stems from repeating many of the extreme things heard from right wing politics. Colbert's viewers are loyal if not fanatical. In 2006, Colbert asked his viewers to vote online to name a Hungarian bridge after him. He won; of course the joke was that he won with 17,231,724 votes which happens to be 7 million more people than in all of Hungry. The result was that the Hungarian Ambassador to the United States was a guest and presented Colbert with a certificate declaring him the winner of the voting but the bridge ended up being named for somebody else as a law said the name could not be for a living person. Both shows take a different approach but both do the same thing in a terrific manner showing us the absurd side of the news especially politics. Personally, I find both of the shows excellent. If you haven't seen them, they are well worth a watch. Surfing the news on the Net, one will run across clips from the Daily Show and the Colbert Report however these links, if the source is American, link back to Comedy Central's American site. If you click on the video you will end up with a message saying the video can only be shown in the United States. How unfortunate. The same clip is available on Comedy Central's Canadian site, The Comedy Network but there is the problem of trying to find it. As I pointed out in my blog Internet TV, the various outlets broadcast over the Internet but still try and respect the borders of the country: U.S. videos only for the U.S. This is a bit of a pain and one would hope that at some point in the future, broadcasts like YouTube videos would become available on the Net period; no question of restricting viewers by country. 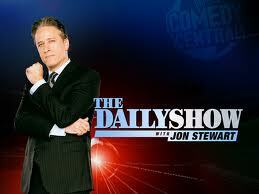 Yes, the Daily Show scored the big one by having the president of the United States as a guest. Go to Comedy Central in the U.S. (http://www.comedycentral.com) or The Comedy Network in Canada (http://www.thecomedynetwork.ca) and look for the October 26th show. Why this appearance? First, elections for the 37 out of the 100 seats in the Senate will be held on November 2. Second, to prepare for Saturday's rally, Stewart has been doing his show in Washington all week. What will happen at the rally? Everyone at the Stewart camp is quiet however considering the steam this event is taking on, one has reason to believe this is going to end up being larger and consequently a little different from what Stewart may have had in mind in the beginning. What started out as a joke may end up being serious. "Take it down a notch America" indeed. This page lists local rallies around the United States; each one is totally local being put together by volunteers not actually associated with the TV shows' main rally in Washington. As of this writing I count almost 60 independent rallies! Plus I count 12 international rallies including Montréal, London (England), Paris and even the Base Camp at Mt. Everest, Nepal. To those of you who have never watched these shows or even if you have, I offer the following links. The articles are comprehensive and contain many interesting stories about the shows.